Looking for help with the error message, "Your IT Department has turned off signup for Microsoft Power BI"? Visit our documentation section! NOTE: Information listed here is good as of 2/18/2015 and is subject to change. If you are an Admin for an Office 365 Tenant, you may not want users to be able to sign up for the Power BI service without you knowing about it. This could be for users that are necessarily created within your tenant that may start showing up. We do have an ability to blog the Individual User sign ups. Here is the documentation that talks about how to do this. We can issue PowerShell commands against Azure Active Directory to disable AdHoc Subscriptions. This is for Adhoc Sign Ups and is not specific to Power BI. This will block it for anything from the Azure Active Directory perspective and into Office 365. You can’t pick and choose what you allow and what you don’t allow. It is an all or nothing thing. You can re-enable it at a later time if you want. To disable it, we need to setup the Azure Active Directory PowerShell items. This can be done via the following documentation. 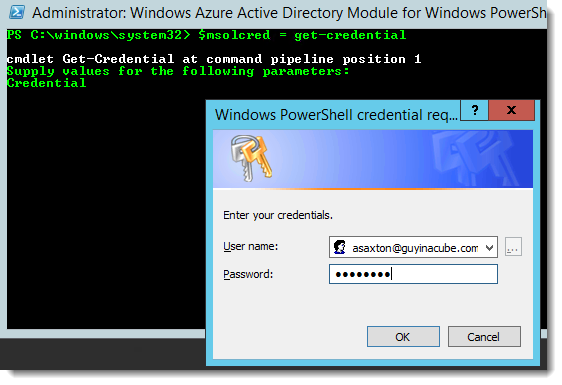 Within the Azure Active Directory PowerShell command shell, we first need to sign in with our credential. This is a credential that you would for O365 that is an admin of the service. The first line will prompt you to enter your credentials. The second line actually does the connect to Azure Active Directory. After that, we can issue the command to disable the free sign ups. This will just bring you back to the command prompt. You can also issue the following command to see what it is currently set for. Once this is done, when a user goes to http://www.powerbi.com and tries to sign up, they will see the following. We can't finish signing you up. Your IT department has turned off signup for Microsoft Power BI. Contact them to complete signup. As an Admin, you can then assign Power BI licenses to users that you want to be able to use it. This allows you more control over your organization, but at the same time could reduce usage as people wouldn’t be able to just go and sign up on their own. If you do want to allow this, but want to control it, be sure to publish some information about how people can do this within your organization.